The weather in Memphis is weird. Last week there was one random day where it was warm enough to play outside, the next day it was 32 degrees. But we snapped up the chance to go outside since Sarah has been asking to kick the soccer ball. 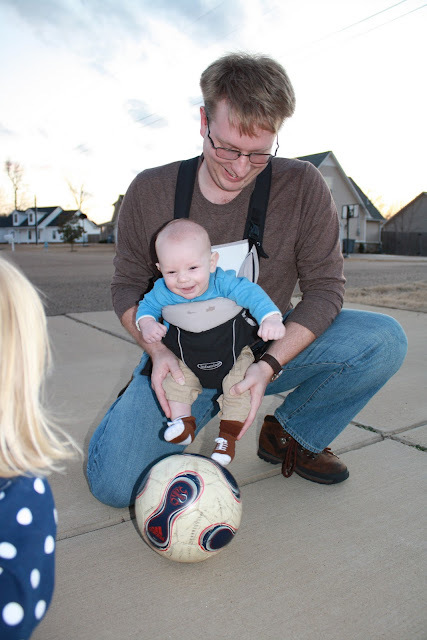 Daddy showing Sarah proper soccer technique. Action shot! It really looks like Sarah is actually dribbling the soccer ball in this picture. I'm pretty sure she's not, but we can still pretend. Sarah likes to kick the soccer ball, however, she REALLY likes to tell other people to do it. She'll often pick it up and come put it in front of one of our feet and tell us, "Mommy kick soccer ball!" then after I kick it she'll retrieve it and take it to daddy. This time it was Cody's turn. So Chris obliged and helped Cody kick the soccer ball. Cody loved kicking the soccer ball! He was smiling really big and laughing out loud! Now, I'm not sure if it was the soccer ball that was making him laugh so much or all the attention he was getting from his sister, but he had a great time playing soccer with the family. I hope the winter comes and goes quickly so we can spend more time outside as a family. Too precious! Btw, my sister (miss g) was over at my house yesterday and saw Cody's birth announcement on the fridge and loved the "freestylin'" comment. So fun!